"I had an excellent hotel stay. The room was clean and comfortable, and the employees were friendly. Great happy hour food, and the complimentary breakfast buffet was more than I expected. I'll definitely stay here again.2017-07-30"
"Nice hotel. The room was clean and comfortable, and the staff was friendly and accommodating. Stay here.2016-07-09"
"The price was right, and the hotel was convenient and enjoyable. Everything was great, and I loved the food.2016-06-03"
"I was pleasantly surprised by this hotel. The room was large, and we enjoyed the free drinks, soda, popcorn, and breakfast. The kids were happy with the pool. Everyone wanted to stay another night. This is the perfect place for the whole family.2016-05-24"
"This hotel was well worth the stay. It was clean, and the staff was friendly. Excellent amenities, and good continental breakfast. Stay here.2015-08-11"
"Super good hotel stay. Great room and breakfast. 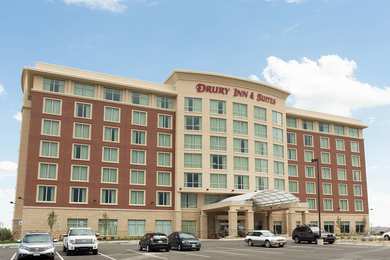 The staff was helpful and knowledgeable about the area.2015-04-28"
"Hotel was new and clean. Friendly, helpful staff. The buffet breakfast and light dinner were great treats. You'll love staying here.2015-03-13"
"Easy access to the highway. Room was clean and nice, and the bed was great. Good breakfast, too. Good hotel.2015-03-12"
Learn more about Denver Hotels & Motels in our Denver Hotels Guide.